Relate the linear momentum of a photon to its energy or wavelength, and apply linear momentum conservation to simple processes involving the emission, absorption, or reflection of photons. Account qualitatively for the increase of photon wavelength that is observed, and explain the significance of the Compton wavelength. The quantum of EM radiation we call a photon has properties analogous to those of particles we can see, such as grains of sand. A photon interacts as a unit in collisions or when absorbed, rather than as an extensive wave. Massive quanta, like electrons, also act like macroscopic particles—something we expect, because they are the smallest units of matter. Particles carry momentum as well as energy. 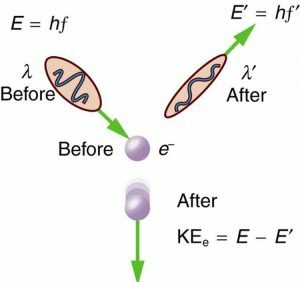 Despite photons having no mass, there has long been evidence that EM radiation carries momentum. (Maxwell and others who studied EM waves predicted that they would carry momentum.) It is now a well-established fact that photons do have momentum. In fact, photon momentum is suggested by the photoelectric effect, where photons knock electrons out of a substance. Figure 1 shows macroscopic evidence of photon momentum. 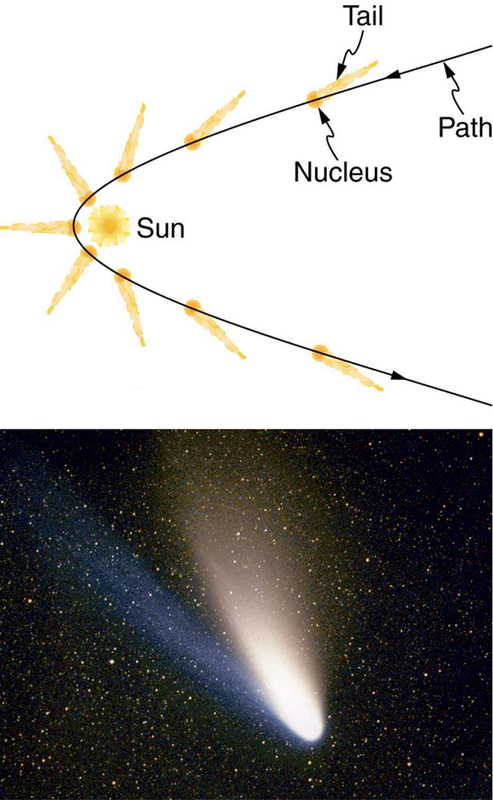 Figure 1 shows a comet with two prominent tails. What most people do not know about the tails is that they always point away from the Sun rather than trailing behind the comet (like the tail of Bo Peep’s sheep). Comet tails are composed of gases and dust evaporated from the body of the comet and ionized gas. The dust particles recoil away from the Sun when photons scatter from them. Evidently, photons carry momentum in the direction of their motion (away from the Sun), and some of this momentum is transferred to dust particles in collisions. Gas atoms and molecules in the blue tail are most affected by other particles of radiation, such as protons and electrons emanating from the Sun, rather than by the momentum of photons. Not only is momentum conserved in all realms of physics, but all types of particles are found to have momentum. We expect particles with mass to have momentum, but now we see that massless particles including photons also carry momentum. Figure 2. The Compton effect is the name given to the scattering of a photon by an electron. Energy and momentum are conserved, resulting in a reduction of both for the scattered photon. Studying this effect, Compton verified that photons have momentum. We can see that photon momentum is small, since and is very small. It is for this reason that we do not ordinarily observe photon momentum. Our mirrors do not recoil when light reflects from them (except perhaps in cartoons). Compton saw the effects of photon momentum because he was observing x rays, which have a small wavelength and a relatively large momentum, interacting with the lightest of particles, the electron. (a) Calculate the momentum of a visible photon that has a wavelength of 500 nm. (b) Find the velocity of an electron having the same momentum. (c) What is the energy of the electron, and how does it compare with the energy of the photon? Finding the photon momentum is a straightforward application of its definition: . If we find the photon momentum is small, then we can assume that an electron with the same momentum will be nonrelativistic, making it easy to find its velocity and kinetic energy from the classical formulas. which is about five orders of magnitude greater. as determined experimentally and discussed above. Thus, is equivalent to Compton’s result . For a further verification of the relationship between photon energy and momentum, see Example 2. Almost all detection systems talked about thus far—eyes, photographic plates, photomultiplier tubes in microscopes, and CCD cameras—rely on particle-like properties of photons interacting with a sensitive area. A change is caused and either the change is cascaded or zillions of points are recorded to form an image we detect. These detectors are used in biomedical imaging systems, and there is ongoing research into improving the efficiency of receiving photons, particularly by cooling detection systems and reducing thermal effects. Show that for the photon considered in the Example 1. We will take the energy found in Example 1, divide it by the speed of light, and see if the same momentum is obtained as before. This value for momentum is the same as found before (note that unrounded values are used in all calculations to avoid even small rounding errors), an expected verification of the relationship . This also means the relationship between energy, momentum, and mass given by applies to both matter and photons. Once again, note that is not zero, even when is. Note that the forms of the constants and may be particularly useful for this section’s Problems and Exercises. Photons have momentum, given by , where is the photon wavelength. , where for a photon. 1: Which formula may be used for the momentum of all particles, with or without mass? 2: Is there any measurable difference between the momentum of a photon and the momentum of matter? 3: Why don’t we feel the momentum of sunlight when we are on the beach? 1: (a) Find the momentum of a 4.00-cm-wavelength microwave photon. (b) Discuss why you expect the answer to (a) to be very small. 2: (a) What is the momentum of a 0.0100-nm-wavelength photon that could detect details of an atom? (b) What is its energy in MeV? 3: (a) What is the wavelength of a photon that has a momentum of ? (b) Find its energy in eV. (a) A -ray photon has a momentum of . What is its wavelength? (b) Calculate its energy in MeV. 4: (a) Calculate the momentum of a photon having a wavelength of . (b) Find the velocity of an electron having the same momentum. (c) What is the kinetic energy of the electron, and how does it compare with that of the photon? 5: Repeat the previous problem for a 10.0-nm-wavelength photon. 6: (a) Calculate the wavelength of a photon that has the same momentum as a proton moving at 1.00% of the speed of light. (b) What is the energy of the photon in MeV? (c) What is the kinetic energy of the proton in MeV? 7: (a) Find the momentum of a 100-keV x-ray photon. (b) Find the equivalent velocity of a neutron with the same momentum. (c) What is the neutron’s kinetic energy in keV? 8: Take the ratio of relativistic rest energy, , to relativistic momentum, , and show that in the limit that mass approaches zero, you find . Consider a space sail such as mentioned in Example 1. Construct a problem in which you calculate the light pressure on the sail in produced by reflecting sunlight. Also calculate the force that could be produced and how much effect that would have on a spacecraft. Among the things to be considered are the intensity of sunlight, its average wavelength, the number of photons per square meter this implies, the area of the space sail, and the mass of the system being accelerated. A car feels a small force due to the light it sends out from its headlights, equal to the momentum of the light divided by the time in which it is emitted. (a) Calculate the power of each headlight, if they exert a total force of backward on the car. (b) What is unreasonable about this result? (c) Which assumptions are unreasonable or inconsistent? (b) The wavelength of microwave photons is large, so the momentum they carry is very small. which is consistent with the equation for photon energy. (b) Headlights are way too bright. (c) Force is too large. 29.4 Photon Momentum by OpenStax is licensed under a Creative Commons Attribution 4.0 International License, except where otherwise noted.